Some of us have noticed that Anthony Watts often recycles stuff. This time it's with a difference. He's recycling but shifting goal posts at the same time. The major regime transition is at the maximum of the integral at 2005.71, which corresponds to October 2005, the same date I identified. Clearly the sun entered into a magnetic funk then, and has yet to come out of it. We live in interesting times. It's worth doing a timeline. Some say it is no coincidence that 2008 has seen a drop in global temperature as indicated by several respected temperature indexes compared to 2007, and that our sun is also quiet and still not kick starting its internal magentic dynamo. Ooh! The temperature dropped in 2008 and it's the sun so we're heading for a Dalton Minimum! How did that work out? Yes. It looks as if we're heading for an ice age. 2008 was the coldest year since - oh, just for ever - since way back eight years prior - way back almost since records began - it was the coldest year since 2000. The dramatic “hockey stick” trace, which began in 1976 accompanied by a major transition in the Pacific Decadal Oscillation, ends at the onset of the 21st Century and might be better termed the modern warming regime. This regime was replaced by a pronounced cooling regime. He pronounced, after drawing some curves and digging some holes that: the modern warming regime ended in 1997. Well, there were two subsequent years that were cooler than 1997, namely 1999 and 2000. But for the rest? Where has Sam's cooling regime gone? the actual drop in surface temperature over the first decade of the 21st Century is probably more than double the conservative estimate in the realm of 4-6 C.
That is, he reckons it's now 8°C to 12°C cooler than when? The 1990s? And no-one noticed? Talk about the Day after Tomorrow! Is this what Deluded Sam thinks has happened between 2000 and 2010? It's possible that he was only talking the "surface temperature" at the boreholes, not the global average surface temperature. But nothing would surprise me at WUWT. Fast forward to February 2014. To today. Sam has another shot (archived here, update here). This time he does some more number crunching and reckons that "The convex inflection in 1998 appears to mark the end of the Modern Warm Regime." Okay, so now he's shifted up a year. There have been more subsequent years that have been cooler than 1998. Still, it's not got any cooler. Four years since 1998 have been as warm or warmer, 2002, 2005, 2007 and 2010, according to GISTemp. But hey, wait a minute. 1998 - that rings a bell doesn't it. Something about a super-El Nino. According to Sam and Anthony, not only did the Modern Warming Regime stop in 1997 1998, but there has been an "onset of cooling" that onsetted in 2004. Or, as Anthony wrote, in October 2005. 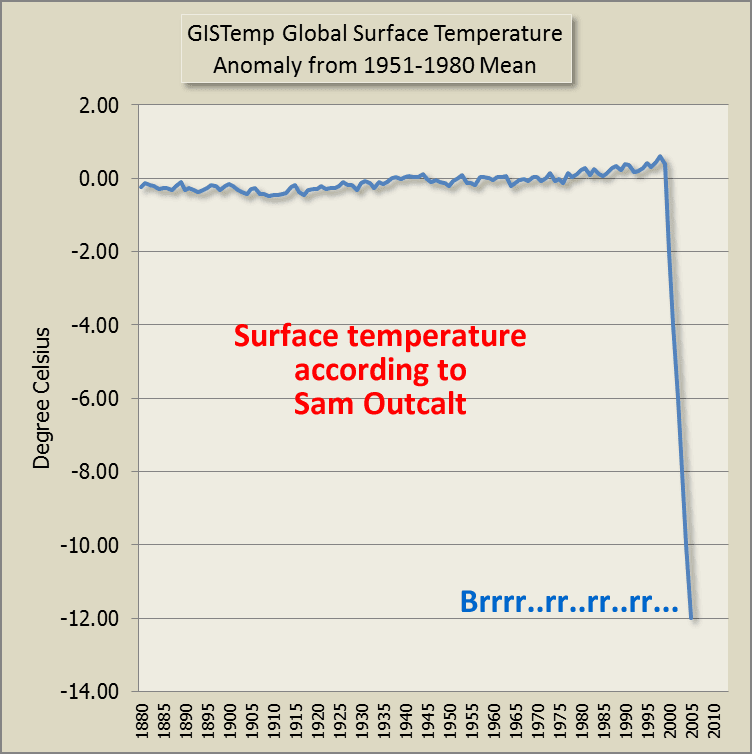 Why the onset of cooling didn't onset itself at the end of the Modern Warming Regime in 1997 1998, Sam doesn't say. And why they keep shifting the dates of these regime shifts, heaven only knows. So to sum up the current state of affairs. The Modern Warming Regime stopped in 1997 1998. The onset of cooling onsetted in 2004 or October 2005. So how many years have been cooler than 2004? Well, the fact of the matter is only one year has been cooler than 2004 according to GISTemp and that was 2008. So that brings us full circle to Anthony's 2008 article where he reckons that we were heading for a Dalton minimum. But then Anthony Watts claims a "major regime shift" in October 2005. HW readers know that 2005 tied with 2010 as the hottest year on record so far. Back in 2012, Tamino wrote an article about Emeritus Sam Outcalt, with his usual flair. As did Ben at Wotts Up with That. Scientists have already looked at what would happen if the sun decided to go very quiet and I've written about that a few times already, such as here - with links to the science. Time will tell. I don’t see any big change, but what do I know? Sorry but I don’t think this study has merit. Whether the integral goes up or down depends on where you put the average that you substract from the data, so it is an important value. But we cannot be sure that the average of the last 60 years in particular has any physical significance. We don’t know if it represents the real average status of these solar variables. Other 60 year periods would offer different average values to substract, based on which the integrals would have looked different. If it is not caused by man and curable through considerable wealth transfers from the productive to the political class then it is not worthy of inclusion in IPCC reports. They might well have seen it and rejected it. I believe this is the case for historical measurements of CO2 levels other than ice cores, which show concentrations exceeding 400 PPM over a century ago. Steven Goddard is one of the scientists who was sidelined in the climate scammers’ takeover by non scientists, of scientific reporting on climate. The raw data is placed unaltered online by law. kramer says: February 12, 2014 at 4:45 am I’m sure Leif will have something to say about this. I consider this kind of paper to be voodoo cyclomania, so count me out. To which Anthony Watts replies that he "thinks not" but in the same comment talks about the "new regime". And remember his comment in the article itself, where he claims joint ownership of the "major regime transition" in October 2005 or was it 2004! REPLY: It’s not a paper, its an email posing a question. 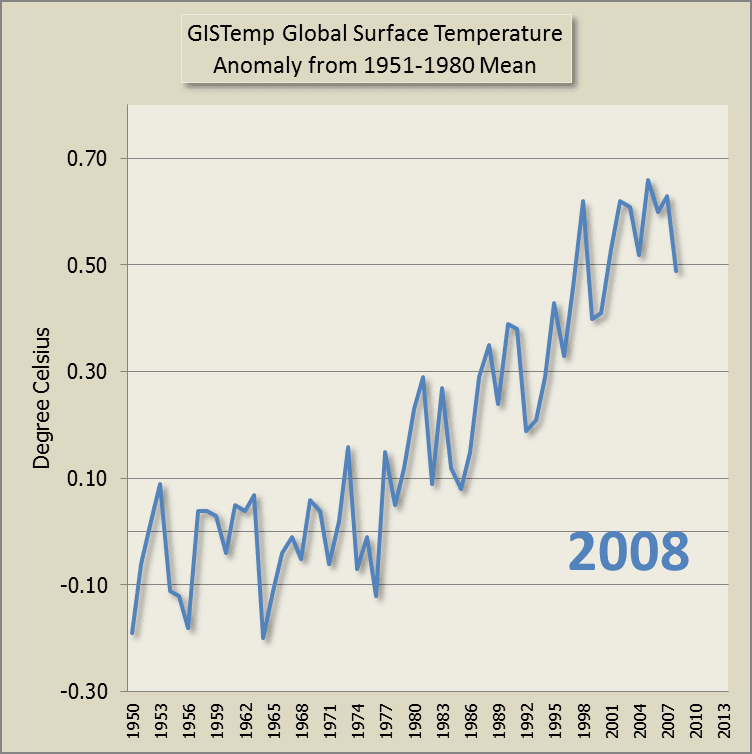 The question is; “can the TSI data be linked to global temperature”? Like you, I think not, but I’m always willing to ask the question again with new data and analysis. In the entire climate blogosphere, is there anybody further up their own behind than Brandon Schollenbeger? He's collating a series of 'Michael Mann's worst errors', apparently as a resource for the pending libel case. He's written an introductory post, setting out a series of half-truths and irrelevencies. You may have seen the link from WUWT. I chipped in, this gets a bit technical but I pointed out, for example that a simple misunderstanding about a file format many years ago was not going to impress a judge, that the NAS panel on reconstructions didn't actually say what was being asserted about Bristlecones, that Mann's withholding r2 scores was irrelevant as the same panel had decided that r2 was a pretty useless metric anyway, and that the MBH algorithm does not actually generate Hockey Sticks from properly randomised input. If anybody else fancies giving poor old Brandon a hand with his weird little project, pop over to the Izuru blog. (I won't link as I know Sou doesn't like linking to denier sites, but I archived it here http://archive.is/cBZmZ). I'd strongly urge you to let Schollenberger embarrass himself as much as he is able. In fact I would encourage him - in the long run it would only help the case of reason if the defense is shown to be actively working with anti-science to make their case. Why can't these tedious nutters just look at the data? Here's a composite TSI reconstruction (Leif Svalgaard's and probably one of the better ones) compared to GAT. You're too kind Sou: It's not "recycling regimes"
It's embracing lies as tactical tools - which equals rejection of serious science. BBD - they don't care about the data - they only care care about their god of endless increasing consumption. I suggest it boils down to two different perceptions of our planet and Earth sciences. At the heart of one is an appreciation that our Earth is a living organism, one that has taken four and a half billion years, evolving one day at a time, to arrive at the beautiful cornucopia that awaited a restless inquisitive human species. The other mindset sees our planet through the lens of ancient texts and tribal dogmas. To this group of humanity our life sustaining planet, Earth, isn't any more "real" than a Hollywood movie on the other side of the screen. It's only function is to fuel our economy.
. . . So they simply refuse consider what's actually happening on this planet. For balance, old-style Marxists have the same attitude as libertarians. They don't recognise limitations; given the right social order and political consciousness the workers, united, can achieve anything. And there went the Aral Sea. True. In the UK we've got Living Marxism (LM) which begat Spiked! magazine and gave us dear old Ben Pile - and others. You are probably correct. Libertarianism does seem to be closely linked with cornutopian fantasies. Hence the classic libertarian hatred of environmentalism. They don't accept any concept of limits or consequences. It is astonishingly like the solipsistic behaviour of small children in a way. Apologies for the typo on the graph heading - that should be cubic fit, of course. Mesopotamian units of measurement don't come into it. It really doesn't matter to these people that their predictions have proved wrong. They are clebrated as fact when they are made, and no attempt is made by their groupies to follow up. Now they're wringing the very last out of 1998. There was a PDO shift between 1998 and 2004, but denialists read this as a cycle, not an oscillation from one state to another. They assumed the cooling effect would be continuous, and by 2007 it was being widely announced that we had "entered a long-term cooling trend". More than a decade of AGW has easily cancelled the effect of the PDO shift, and of course the next shift is not going to be so accomodating to deniers as the last one. It would be unkind to mention that the next shift will be the last one many of them are likely to see, so consider it mentioned.